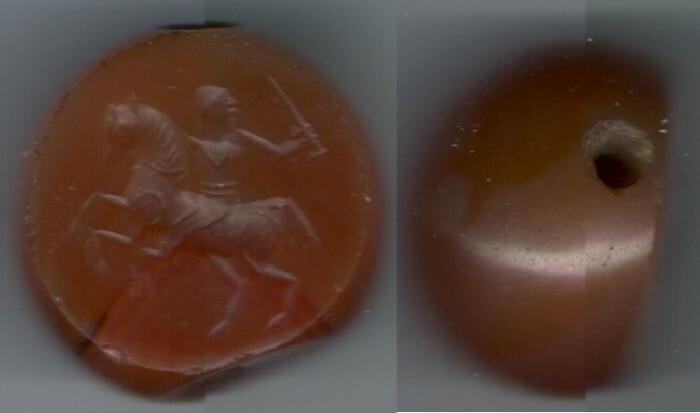 Ancient Near Eastern Art: Carnelian Scarab Seal Gem, A Parthian/ Sasanian horseman waving a sword, made to be worn around the neck, red in color. * This old Carnelian Scarab Seal bears a portrait of a horseman riding left but looking back waving a sword in the air in Parthian fighting fashion. * The stone is in red color, in round shape weighing 5.98gr. (18 X 13 mm. in size). There is a hole going through the stone indicating that it was intended to be worn around the neck. * I will be grateful for any further information about this piece you can provide me.